Lindsay Andronaco (APRN, Medical Director, MSN, RN, AGACNP-BC, CWCN, WOC, DAPDCA, FACCWS) is well regarded for her passionate leadership and her overall holistic approach to medicine. She was recognized in Case in Point magazine as being one of the “Top People in Healthcare”. She has complete training in Botox and Fillers. And she has years of experience in surgery and skin/wound care. She has specialized in skin care, surgery and wounds/ trauma. She graduated from the University of Vermont with a bachelor’s degree in Nursing and later went on to complete her Nurse Practitioner degree in Adult and Gerontology Medicine. She received her Masters of Science in Nursing from Walden University. 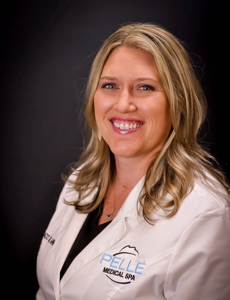 She is the Medical Director at Pellé Medical Spa. She providea cosmetic dermatology and aesthetic medicine services, including: laser procedures, sexual wellness, cosmetic injections and more.